Today, I have an interview with British writer Gary Dolman. 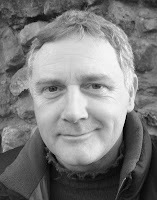 Gary is the author of the historical novel The Eighth Circle of Hell. Tell us a bit about The Eighth Circle of Hell. The novel is set in 1890 in the wealthy spa resort that was Harrogate, Yorkshire, England. The Victorian age is often held up as a shining era of British history; a time of wealth and power, of civilisation and philanthropy. It was indeed all of these. But it was also a time of great cruelty and depravity, where power and wealth were used to ill-purpose. In particular it was the time of the ‘Defloration Mania’ where hundreds of thousands of young, innocent girls were bought and sold like the slaves they became. In The Eighth Circle of Hell, an elderly workhouse ‘imbecile’ is continually tormented by disturbed and fractured memories of her adolescence. She had been orphaned and sent to live with her depraved uncle and his powerful, predatory friends, and advancing, dementia has caused her to regress inexorably back in her life, to the point where she is once again re-living that awful time. Husband and wife commissioned investigators, Atticus and Lucie Fox are engaged by her grown-up nephew to trace her and to bring her back to live in the family home where her elderly, frail uncle still lives. They do so, but are horrified to hear the very next day that she had brutally murdered her uncle in the night. But they were puzzled too; how could she have committed murder? She had neither the physical, nor the mental strength to do such a thing. The novel is a bleak study of the stark contrast between the polite, strictly-ordered society of the Victorian age and the utter depravity and exploitation of the vulnerable it shielded. It demonstrates how in the midst of that depravity, promises and friendships can be forged that are more enduring even than the boundaries of life and death itself. It was quite by chance. One evening several years ago, whilst I was visiting my father in a care home, one of the other residents who was also in the end-stages of Alzheimer’s suddenly cried out in her sleep, begging some uncle to stop, screaming that he was hurting her. It made me start to imagine what kind of horrors she must have been reliving and that inspired the idea behind the novel. 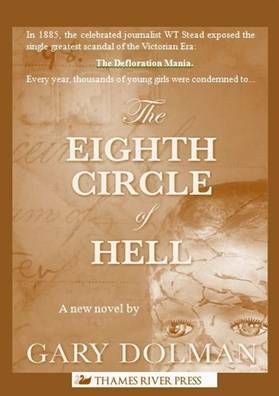 When I began to research the history of child abuse, I came across the holocaust that was the Defloration Mania and The Eighth Circle of Hell took form. Can you explain the meaning of the title? The title comes from Dante’s epic poem, Divine Comedy. The eighth of Dante’s nine circles of Inferno – of Hell, contains those guilty of the sin of seduction. It’s a play on the profound contradictions in the novel where the perpetrators of the abuse push the blame for committing it onto the victims. In Dante’s poem, the sinners are driven round and round the Eighth Circle by demons. In the same way, my central character’s recurring memories drive her around and around in torment. How did you decide you wanted to write historical fiction? Do you write in any other genres? I have always been fascinated by history in general. Living for much of my life in Harrogate, which is a town built largely in the Victorian age, means that I have a particular attachment to that period. The richness and the social extremes of the Victorian Age are especially poignant and stumbling across the Defloration Mania gave me a perfect excuse to set the novel in that time. Because it is also crime fiction, there is also the advantage to a writer that with very little forensic science other than early fingerprinting, detectives had to rely much more on their reasoning and intellect. My publisher, Thames River Press, has requested a series of three novels, all related in terms of genre and characters and I have at least half a dozen plots for novels beyond that, all of which feature Atticus and Lucie. I’m becoming rather fond of them if I’m honest. Having said that, I am also itching to write a really dark, contemporary psychological thriller. I have completed my second manuscript featuring Atticus and Lucie Fox. Their next investigation concerns a number of brutal murders which appear to centre on a long-vanished Northumbrian castle, and on the delusions of a madman who believes he is the father of King Arthur. The Madman of Sewingshields is due for publication in May 2013 by Thames River Press. Beyond that am just beginning a third novel, inspired by the Northern British folklore of yetis. The Eighth Circle of Hell is available from Thames River Press. Readers can purchase copies from Amazon US or Amazon UK. Gary Dolman was born in South Tyneside in 1963, but grew up principally in Harrogate in North Yorkshire, where he now lives with his wife, three children and two dogs. He is fascinated by the human mind and how it contends with adversity in all its forms. He is also passionate about the history – real and mythical – of the north of England. Visit Gary's blog at http://www.garydolman.blogspot.com/.